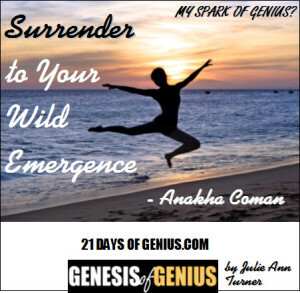 12.4 Surrender to Your Wild Emergence! 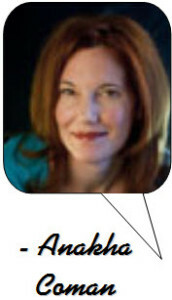 of the inner spark of wildfire genius. I surrender to the sacred tremoring of my true nature. The breath, beat, brilliance that streams through all that I am and all that I do. I feel the aliveness of all creation in this moment, in my movement. It beckons and begs for my surrender, for my letting loose of the grip-grasp control. To wait as it tenderly guides me to a wholly, holy consecration of my being with my becoming. I am one with this flaming, untamed intelligence burning bright and bringing forth in effortless flow. The emergence dances wildly at my feet and whispers desirously in my ear. consumed by the will-to-be life force, the ripeness stirring deep within. I am naked, disrobed, stripped of all defense. It is now, my surrender. Anakha Coman is Founder of the Awakened Leadership Institute and speaks, teaches and consults with leaders and organizations worldwide including Intel, Nike, OHSU, Save the Children and HealRWorld. She is author of The Proof: A 40-Day Program for Embodying Oneness (Hay House 2009), The Law of Emergence: Living Your Soul's Blueprint for Brilliance and Remembering Oneness, a collection of mindfulness meditations.